Great flavor: chocolate, alcohol, small wood flavors, with significant but subtle nuttiness. A lot of sediment with a cloyingly thick mouthfeel though. Pours a black color. 1/4 inch head of a tan color. Poor retention and poor lacing. Smells of strong sweet malt, alcohol, chocolate, slight roasted malt, yeast, and oatmeal. 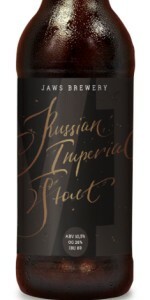 Fits the style of a Russian Imperial Stout. Mouth feel is smooth and clean, with a low carbonation level. There is also an elevated roasted malt bitterness and noticeable thickness. Tastes of strong sweet malt, alcohol, roasted malt, chocolate, slight roasted malt, yeast, slight wood, and oatmeal. Overall, weak appearance, but good feel, complexity, and body. Poured from 0.33l bottle into pint. L: Turbid pitch black with a weak beige foam head. S: Cocoa beans , milky coffee. T: Bitter dark chocolate, vanilla, cofeee. F: Tight body and no carbonation. O: Typical RIS. Worth a try. Radical opaque black, no head, only several tan bubbles on a top. Sediment on the bottom. Smell - coffee, dark fruits, roasted malts. Taste - sweet, chocolate, coffee, vinous, dark fruits.